Summer has seems to have flown by. I can’t believe we are already heading into late August. Sweet peppers are on the horizon along with a late planting of bi-color super sweet corn. We’ve had some problems with our corn crop that has been slowing down production. I hope to have it in the box in the next few weeks. The CSA just got a $200 grant to a seed catalogue (from a local farmer who is willing to grow for us) and we are going to branch out with some new varieties. I’m looking through the Johnny Seed Catalogue, but let me know in the next week if you see something you’d like to have in your CSA/JUICE box. We are planting mainly for fall and winter, but I’ll keep Spring/Summer seeds in mind for later. Spices are truly the pharmacy of your kitchen. With anti-inflammatory properties, anti-cancer nutrients, and antioxidants they should be added to every meal! Often black pepper goes unnoticed amongst the many many spices that can inhabit your pantry. But this simple spice adds incredible health benefits to any meal! Peppercorns are anti-inflammatory and therefore protective against arthritis, Alzheimer’s, cancer and other conditions. Black pepper is also diaphoretic meaning that it increases perspiration and is therefore good for detoxification, especially of environmental toxins. It promotes circulation and is considered pungent and heating. It’s also great for the intestines as it naturally stimulates the digestive processes. Black pepper should be consumed with other spices as it also has the ability to increase your body’s ability to absorb the antioxidants from other spices, vegetables and foods. Be sure you’re buying whole kernels and freshly grinding them on your meals. Pre-ground pepper could easily have been sitting in the jar for months and months before you even bought it and is susceptible to developing mold. So be sure to add freshly ground pepper to increase the antioxidant value of your locally grown veggies!! 1.Preheat oven to 350 degrees F. Spray 8×11 baking pan with nonstick cooking spray. 2.Place oats in blender or food processor and process until finely ground. Don’t worry, it doesn’t need to be perfect but it should take a few minutes. Set aside. 3.In a large bowl of electric mixer, cream together peanut butter, applesauce, honey and vanilla until smooth. Add in zucchini, cocoa powder, ground oats, baking soda, and salt; mix until well combined. Gently fold in 1/4 cup of chocolate chips. 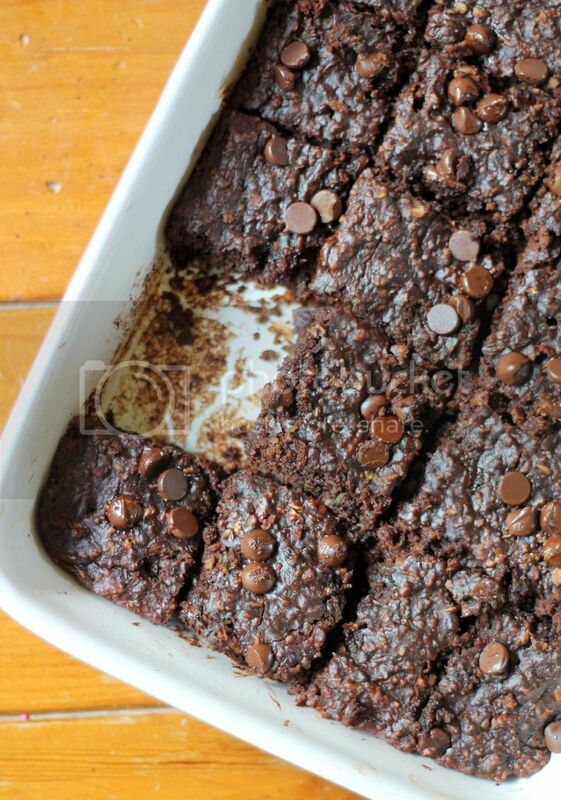 Pour batter into prepared baking pan and sprinkle remaining chocolate chips over the top. Bake for 25-30 minutes or until tooth pick inserted into middle comes out almost clean. 4.Cool brownies completely on wire rack then cut into 20 squares. Enjoy! 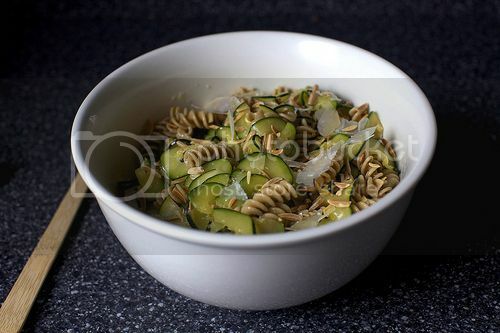 Stir zucchini, green beans, parmesan, almonds and pasta together. Whisk together olive oil and lemon juice, seasoning generously with black pepper and salt to taste. 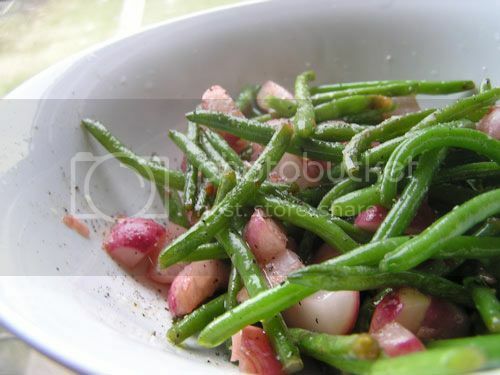 Toss with salad and adjust seasonings to taste. Pack up salad and take it with you to the beach. bring water to boil in a small sauce pan, add rinsed quinoa, cover and cook on low for 10 minutes. turn off heat and allow to sit for 10 minutes. meanwhile, prep your green peppers, corn & tomatoes – place in a medium bowl. slice olives and place in bowl with rest of veggies. 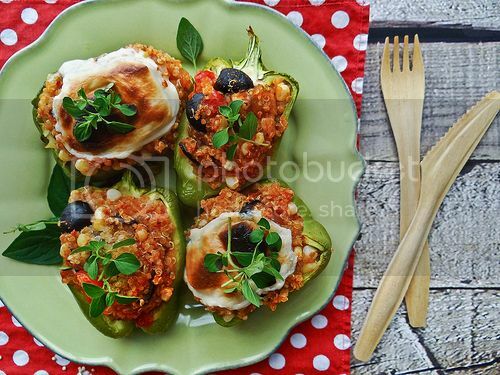 arrange green pepper halves on a rimmed baking sheet, cute side up. add cooked quinoa to the veggie bowl along with prepared salsa, mix well. fill each pepper half with as much quinoa as you can. top with slices of daiya – bake in a 350* pre heated oven or toaster oven for 20-25 minutes. garnish with oregano. enjoy! More greens! You can NEVER have enough greens 🙂 Plus the addition of greens to your juice adds an incredibly amount of chlorophyll, the nutrient responsible for that deep green coloring. Chlorophyll is very cleansing and naturally wonderful for the liver. Kale is high in chlorophyll as well as minerals like magnesium, iron and zinc. It does wonders for the skin, especially in combination with carrot juice because of the high levels of beta-carotene that re converted to Vitamin A. It clears the complexion and can also help with other skin conditions like eczema and dermatitis. This nutrient also dramatically boosts immunity and prevents cancer! So make your juice green this week! Helps improve eyesight with tons of vitamin A. The carrots also help eliminate excess fluid from the body reducing water retention. Medical studies have also shown that including beets in your diet helps protect a body against heart disease. The combo of veggies have powerful cleansing properties that are effective in detoxifying the liver, which is overall effective for acne which can be caused by toxicity of the blood. Combine a little bit of each veggie that came in your box for the ultimate combo platter. Add ginger and turmeric for added value. Drink over ice. Drink often. This entry was posted in Uncategorized on August 20, 2013 by Carolyn. We have guests this week. Is it too late to order a large box instead of our small? How would we leave the extra money?